Efforts to pardon Jens Soering might be stymied for the time being, but the message of attorneys and investigators who are convinced of his innocence reached a collegiate audience Friday. Liberty University hosted a showing of “Killing for Love” — a documentary that recounts the courtroom showdown in his case with running commentary from Soering in a prison interview — on Friday evening. Afterward students asked questions of Steven Rosenfield, Soering’s attorney who’s worked pro bono toward the case for his innocence, and J. Thomas McClintock, director of forensic science at LU who’s analyzed the forensics end of the investigation for about five months. Soering, the son of a German diplomat and at the time a bright college student, was convicted in 1990 of first-degree murder in the 1985 deaths of Derek and Nancy Haysom in Bedford County. Elizabeth Haysom, Soering’s then-girlfiend and the Haysoms’ daughter, also is in prison after pleading guilty to murder charges in their deaths. 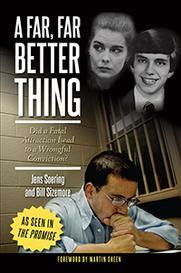 Soering has spent more than 31 years in prison since his conviction. Evidence unveiled in 2016 showed the DNA of blood at the scene didn’t match Soering’s profile, even though it was type O blood. Soering himself recorded a speech to LU students as a preface to the film, some of which was played on campus Friday evening. In it, he drew parallels to the audience since he was an 18-year-old University of Virginia student around the time the Haysoms were killed. “So it is especially important to me to reach out to young adults like yourselves, in the hope that perhaps my experience can be of some benefit to you,” he said. Rosenfield told students having “having exhausted all possible legal remedies,” he’s turned to finding justice for Soering in the form of an administrative pardon, which was submitted in August 2016. Since then, he said those pressing for his pardon have submitted four supplements with the consideration of new evidence. 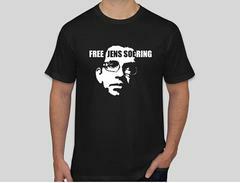 Soering won’t receive such a pardon this year. On Thursday, Gov. Terry McAuliffe said in TV interviews the investigation into DNA evidence in the case still is ongoing, according to The Associated Press. "Mr. Soering's request is still awaiting an investigation by the Virginia Parole Board, after which it will be forwarded to the Governor for his consideration," McAuliffe spokesman Brian Coy told The Washington Post via email, according to AP. "We do not expect that the investigation ... will be complete before the Governor leaves office." According to a transcript, Soering voiced his disappointment in McAuliffe’s lack of action and mused on the potential for Gov.-elect Ralph Northam to free him from prison. Rosenfield said he and the others seeking Soering’s pardon are hoping Northam might “take the rein” with their investigations. After the showing, he said he and others would be able to present evidence — to the tune of 1,500 pages of documents — once any state investigation would start. Quinn McEwen, a first-year law student at LU, remarked on how Haysom’s admission to investigators she killed her parents and “got off on it” seemed to be glossed over, according to the documentary. She and Hannah Smith, another law student, said they took note of the apparent holes in the legal procedure in the case. “I think there was a big jury bias; that’s one of the things that really strikes me about that,” McEwen said after the showing. McClintock and Rosenfield talked about various catches in the case besides the blood samples that lend to Soering’s innocence, from the lack of male DNA under Nancy Haysom’s fingernails that would suggest a struggle with Soering to the confirmation bias investigators seem to exhibit after hearing Elizabeth Haysom say, "I did it." “This was a flawed investigation from the get go, and we are only now piecing together and trying to make a comprehensive case,” Rosenfield said.